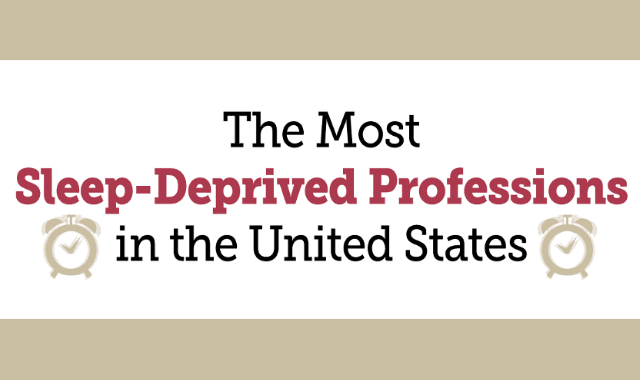 Most Sleep-Deprived Professions #Infographic ~ Visualistan '+g+"
Are you getting enough sleep? Is work getting in the way? These top 25 most sleep-deprived professions certainly seem to cut into workers’ shut-eye. These are the jobs with the highest percentage of workers reporting sleeping a lower amount than what’s recommended by the CDC. With so many sleepy employees, which fields feature professionals that are the least well rested? As it turns out plant and reactor operators, food prep supervisors, and supervisors of production workers are among the worst jobs for those hoping to get a fair amount of sleep. It’s perhaps worrisome that many jobs on our top 25 list are also fairly dangerous jobs, such as firefighting, metal working, and forklift operating. Either that, or they’re jobs that might endanger other people, like nursing, truck driving, or electrical work. These gigs seem like they might be fairly stressful, and as a result more than the national average are losing their share of sleep, with the most sleep-deprived jobs having as many as half of its workers losing hours of sleep. See if your job is one of the most sleep-deprived occupations using this helpful infographic from MattressClarity.com!